One of the most widespread chain restaurants in the world, TGI Fridays has managed to attain the sort of global success that few other chains have replicated. This is a casual dining restaurant that was born in the heart of New York, but has since spread to all four corners of the globe. It is notoriously difficult to establish a theme restaurant as a big brand. You have probably been to a few theme restaurants yourself, but how many of those were part of a big chain? Probably very few, if any. That’s because a certain level of consistency is required for a chain. This makes them very generic as a result. TGI Fridays are different though. They realized that they could create a theme that would not polarize people, a theme that everyone would get behind and one that would be easy to roll-out region-wide, nationwide and worldwide. This is not a Christmas, Religious or nationalistic theme. It’s not a theme that only a certain number of people will appreciate. Because at TGI Fridays, the theme is Friday–everyone’s favorite day of the week. At TGI Fridays, it’s Friday every day of the week. The weekend is always laid out ahead of you, you can always enjoy yourself without repercussions and you don’t need to think about work. Whether it’s Sunday, Wednesday or, God-forbid, Monday, every day feels like Friday at TGI Fridays. 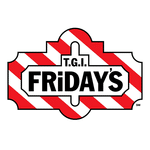 Alan Stillman created the TGI Friday’s brand back in 1965, opening the first location in New York. He wanted to open a bar so he could meet women. But in the process he created a trend for cozy, casual cocktails bars that would prove to be the making of his business. He borrowed money from his mother to open the bar and named it TGI Friday’s after “Thank God It’s Friday”. The bar had a very American feel, but this proved to be one of its unique selling points, and one that helped to take the brand into the global marketplace in later years. TGI Friday’s have pioneered many innovations over the years, and the industry would look decidedly different without them. They were the first to offer a “Ladies Night” promotion, which is now commonplace in the entertainment industry; they have been credited with opening one of the first single’s bars; and they were also the first to sing Happy Birthday to their customers and to make a big song and dance about such occasions. For a chain that celebrates Friday, it will be no surprise to learn that there is a heavy emphasis on alcoholic drinks. They want you to kick-back, relax, unwind and let loose, and there are plenty of drinks to help you with that. They are perhaps best known for their cocktails, and there is a lot of these on the menu. But they also have “Mocktails” for designated drivers. These are cocktails without the alcoholic, and although that might not sound very appealing, they are often sweeter and nicer than their alcoholic counterparts. There is also a selection of wines, beers, ciders and soft drinks. It’s not just about the booze though. There is also an assortment of entrees and appetizers to give you something to snack on while you drink, and there are some more substantial menu options as well. The food is traditional American fare, which means you can expect everything from ribs and burgers, to super-sweet American desserts. The TGI Friday’s secret menuisn’t very big. In fact, there isn’t much there at all. We’ve said it before and we’ll say it again, sometimes casual dining restaurants are a little disappointing in this area. That’s not always the case, of course, and the Pizza Hut secret menu, as well as the Nando’s secret menu, are both testament to this. But even with the vast global reach, the need for customer satisfaction and the varied menu, the TGI Friday’s secret menu is a little on the short side. It does exist though, and if this is one of your favorite chains, it’s worth checking out. We add to this menu as often as we can and we’re always looking for new secret menu items, as well as recipes, secret menu hacks and more. 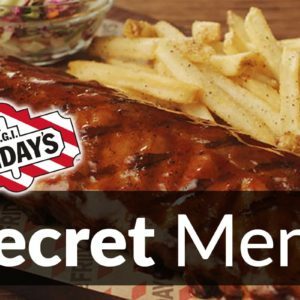 So, be sure to check back regularly and feel free to get in touch and let us know about any TGI Friday’s secret menu items that we’ve missed. There are plenty of healthy options on the TGI Friday’s menu. It’s not traditional fast food, so there is always something for you regardless of your diet or your preferences. Of course, when it comes to the alcoholic drinks, you just have to bite the bullet. Alcohol is generally very calorific, and the best way to reduce the calories is just to reduce the amount you drink. The TGI Friday’s menu used to include items labelled as “Atkins Friendly”. However, this label is no longer used. You can still find low-carb options on the menu, they just don’t want to associate themselves with the diet anymore. There are vegetarian and vegan friendly options on the TGI Friday’s menu, and you can also find gluten-free options in many of their locations. In the UK, TGI Friday’s have embraced the gluten-free diet more than many competing casual dining locations. However, many of their other international locations haven’t quite adopted the same approach and their gluten-free options are a little more limited. To discover more about TGI Friday’s nutrition, be sure to read our TGI Friday’s Nutrition Info page. This contains updated information on all of the calories, fat, sugar, salt and more in TGI Friday’s menu items. If you’re sick of paying high prices for cocktails at fancy bars, then TGI Friday’s may have the answer. These cocktails are cheap, and they are even cheaper if you buy in large amounts. So, be sure to take some friends along and you can load-up on pitchers to drink the night away. The food is also fairly cheap, although this is a causal dining restaurant, not a fast food chain. As a result, you shouldn’t expect to pay the sort of prices you would pay in burger chains like Burger King. Their prices are more in line with rival casual dining locations like Hooters (which also focuses heavily on alcoholic beverages) Nando’s and Olive Garden. To see our full list of TGI Friday’s menu prices, just click onto our updated guide. TGI Friday’s may not have as many locations as many of its rival restaurant chains. However, when it comes to global reach, only the very biggest brands, including the likes of McDonalds and Subway, can rival TGI Friday’s. This brand can be found in over 60 countries around the world, all of which share over 900 locations between them. Even though it serves alcohol, TGI Friday’s is not open until the small hours of the morning. This is not a club, and it’s certainly not a nightclub. As a result, the hours are in line with its status as a casual dining restaurant, which means it opens just before lunch and closes in the evening. There are no breakfast options and the first menu of the day is the Lunch Menu, with the end of the day focusing more on drinks and appetizers, catering for customers who are looking for a little nightcap as opposed to a big meal. Be sure to check-in with your local restaurant to determine when it is open and when it is closed. There are no set hours across the chain and each location is different. The hours also change on Sundays and during certain holidays.